Medfield High School kids compete in a Super Smash Brothers tournament at the Medfield Library. 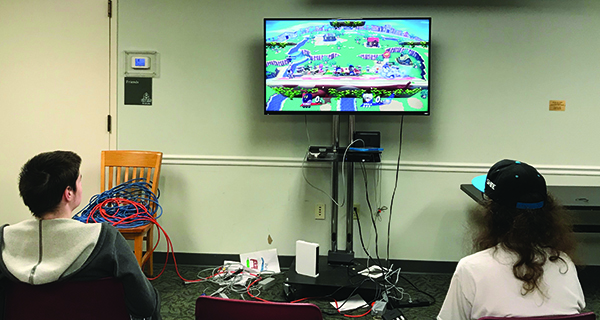 On Saturday, October 20, Medfield High Schoolers showed up to the Medfield Library to compete in a Super Smash Brothers tournament. “It’s been a lot of fun,” said 15-year-old player Peter Travis. Travis is a sophomore at Medfield High School and has participated in the tournament since he was a freshman. 16-year-old Ben Puntonio organizes the tournament for the library every month. Puntionio has played Super Smash Brothers for around eight years, and he enjoys the community built around the game. Two high school kids play against each other during a Super Smash Brothers tournament at the Medfield Library. Although only four kids showed up to the tournament, there are instances when around 16 kids will show up to play. The tournament is a double-elimination bracket style, and it typically occurs once a month at the library. Puntonio creates a Google Docs sheet for people to sign up before every session. The winner receives a $15 to $20 gift card. Cote explained that the age of the kids who participate ranges from younger kids to high school teenagers. Cote explained how the Medfield Library has evolved over the last few years.